Meet Your New Boss – Little Sigma (σ). Not quite a year ago, I wrote my first blog post on Value Based Purchasing. That was triggered by receipt of CMS’s first Quality and Resource Use Report (QRUR) for our LTC medical practice. That report was based on 2012 claims data. As a group, the report said we were bad physicians, spending too much and scoring low on quality. Since then, we’ve studied CMS’s VBP scheme and found significant shortcomings. This summer, CMS will issue 2013 QRUR reports for all medical groups that employed 10 or more staff during that year. We are more confident of receiving a report that shows a higher quality score; we are also 100% certain that our Cost Score will be abysmal. In fact, we are certain that any group of physicians & extenders that serves PA/LTC patients will show up as having unacceptably high costs. Today’s blog focuses on the CMS strategy for calculating the Standard Cost Composite Score for VBP. How Are VBP Scores Calculated? CMS employs multiple versions of VBP – there are schemes for: Hospitals, SNFs, Physicians, etc. Part A providers, like Hospitals and SNFs, are ranked by Quartiles or other congressionally established thresholds. When quartiles are used, providers in the bottom quartile of a measure have money taken away, while those in the top quartile receive an incentive payment based on high performance. In some cases, e.g. SNFs, an arbitrary threshold (i.e. 40% percentile for a rehospitalization rate measure) is set. It is funded by a withhold imposed on all providers (e.g. <2%>). The measure itself may be complex – picking the ‘better’ of an absolute or relative improvement score. Those providers below the 40th percentile score are paid less than they otherwise would have been. Between 50% and 70% of the withheld payments are distributed to the remaining 60% of providers. In simple terms, the bottom group of providers are giving money to the top group. Often there are multiple measures being applied simultaneously, it is unusual for a facility to win or lose 100% of the time. The VBP scheme for Physicians is similar, but couched in much more scientific terms. CMS doesn’t use a crude measure like Quartiles or a number set by Congress – that sounds so arbitrary. Physicians and other professional providers are graded on deviations from ‘normal’ or mean behavior. Only the providers who are above or below One Standard Deviation from the mean are rewarded or penalized. Doesn’t that sound much more objective? Here is an abbreviated refresher course in statistics. 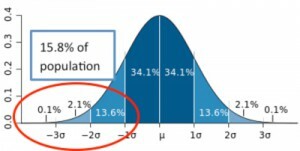 Standard Deviation is a measure of dispersion from the average in a given population (e.g. a set of numbers). The generalized assumption is that any measurements of a random sample drawn from a normal population will yield a frequency distribution that approximates a bell curve. The following illustration shows a typical bell curve. Positions along the horizontal axis represent actual measured values, such as costs. The height of the curve at a particular value represents the frequency (number of instances) of that value. Probability theory predicts the majority of values should cluster around the mean. Some values will deviate from the mean (high or low). About 68% of all values fall within ±1 Standard Deviation from the Mean, while ~95% fall within ±2 Standard Deviations. This concept is illustrated in the graph. By convention, a standard deviation is represented by the symbol little sigma (σ), from the Greek alphabet. A Statistical Measure is only as good as the integrity of the group under study. For example, I’m 5’10” tall. According to this website I’m at exactly the 50th percentile in the population of adult males in the USA. What would happen if I was compared to the population of NBA players? Their average height is 6’ 7” – I’d be among the shortest players in the NBA’s history (3,071 total and only 24 players under 5”10”). Clearly, I’d be at the very far left end of that bell curve. What changed – not my height, just the population to which I was benchmarked. Many providers, particularly PA/LTC physicians and extenders are being benchmarked against their supposed colleagues who staff medical groups serving ambulatory patients. They serve a patient population as alien to Nursing Home Patients as my physique is to NBA players. Think about an office practice chocked full of geriatric patients. Their diagnoses and demographics may match a Nursing Home population. However only some of those patients have a Part A Hospital episode and subsequent SNF stay during the year. If you draw your patient population from Nursing Homes, you are certain that nearly 100% of them entered the facility following a Hospitalization and had many days of SNF care. The actual costs of those two populations cannot be the same. You must pick the correct benchmark if you plan to execute valid comparisons. 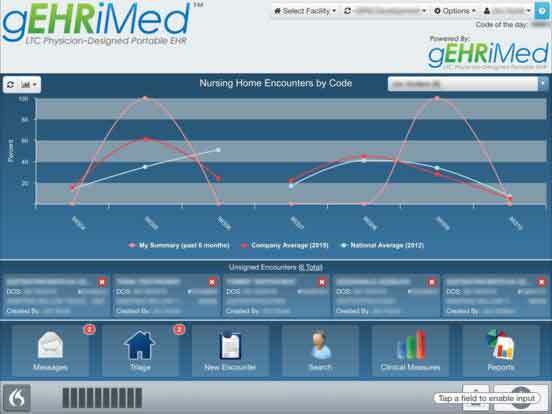 According to the OIG, 25% of all Nursing Home Patients were hospitalized during 2011. During the same period 21% of the total Medicare Population experienced a hospital stay. Each of those Nursing Facility hospital transfers is almost always followed by a return to a SNF stay. PA/LTC medical groups are associated with a service population with a systematically high cost. We can improve our performance, but our comparison group should be other PA/LTC medical groups. CMS is wedded to using statistics to assess provider performance – that is an unavoidable reality. As Providers, we must identify the flaws in their methodologies for selecting quality and cost benchmarks. Otherwise, all of LTC will suffer. Without committed medical staff our patients and facilities will each suffer adverse consequences. It’s worth repeating – I urge readers to submit comments on the proposed 2015 Physician Payment Rules directly to CMS – here is a link to their web portal. If that link breaks, go to www.regulations.gov and search for Docket ID: CMS-2014-0094. Comments are due by 9/2/2014.